First, FOX cancelled Lone Star and then, ABC cancelled My Generation. Not wanting to be left out, NBC has now cancelled Outlaw. 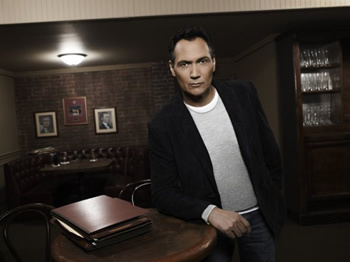 The Jimmy Smits series has ceased production but viewers will still be able to see the remaining episodes. Outlaw follows a Supreme Court Justice (Smits) who decides to step down and go back to being a lawyer in order to fight injustices. The NBC series also stars Carly Pope, David Ramsey, Jesse Bradford, and Ellen Woglom. The series debuted following the season finale of one of NBC’s biggest shows, America’s Got Talent, and could only attract moderate ratings. In its regular Friday night timeslot, Outlaw’s ratings have gone from bad to worse. This past Friday, the show hit a new low in the 18-49 demographic with a 0.9 rating and fell to just 4.10 million viewers. It was in last place in both categories. Should Outlaw have been cancelled? As we previously reported, NBC shut down production last week, supposedly wanting to wait to see if viewership got better in later weeks. If that was actually the case, they didn’t wait very long. Outlaw has been cancelled and the cast and crew won’t be returning to production. For the time being, NBC will fill the 10pm timeslot with an expanded edition of Dateline. The four remaining episodes of Outlaw will be seen on Saturday nights starting on October 16th. An episode won’t be seen on October 30th because of a previously schedule Shrek special. The last episode of Outlaw will air on November 13th. What do you think? Are you sorry to see it go? Why do you think it didn’t attract a bigger audience? More about: Outlaw, Outlaw: canceled or renewed? So sad that I just found out Outlaw has been cancelled, I have been waiting all summer for the new shows to begin in the fall and I just went online to see when the premier was and boom it was cancelled. WHY? It was a FANTASTIC SHOW and as per the survey alot of people are disappointed that it has been cancelled. First Cane now Outlaw has been cancled. The two Jimmy Smitts series that I really enjoyed cancled. When I see some of the garbage that is returning, Jersey Shores for one it really angers me. Another great show gone. cancellations like this one make me wonder about the television industry. The execs at NBC like the show enough to green light the show – they should then back it and not run away after such a short run on the air. I agree John!! Such a well~made show. Great actors& a really good story~line. It reminds me of that show (also cancelled)about overturning decisions in courts cases when the person was innocent. Name?? Maybe something like the Innocence Project?? Another great show cancelled by this lame network! Jimmy Smits cannot catch a break! And it is a shame because he is a quality actor. This was a great show but probably a bad title. I thought it would be a Western with a title like “Outlaw”. I hope someone else will pick it up. Well , I ran across the show when I was looking for the additional parts of Raising The Bar . And when I seen the preview , I had to download it to my Itunes . I think Outlaw for those of us who want to know a little about the American law and how the justice system works is a very good Tv show . And as someone said before , these days . Its mostly about violence . Nothing more . and it is really ashamed because Outlaw is a good Tv show . remains on the air. I hope this show gets reinstated.